It’s Wednesday and that means it’s time to break out the flex fantasy football rankings for Week 4 of the NFL season. Remember that rankings change throughout the week, so be sure to check our staff rankings for updates. 1. Alvin Kamara, NO @ NYG (RB1) — Kamara has seen a massive 29 percent of the Saints targets this season. Yep, he’s a stud. 2. Todd Gurley, LAR vs MIN (RB2) — This is a tough matchup, but it doesn’t matter for Gurley. 3. Ezekiel Elliott, DAL vs DET (RB3) — No player has seen a larger share of his team’s touches so far this season. 4. Melvin Gordon, LAC vs SF (RB4) — Gordon continues to see a heavy workload and should see a favorable gamescript in this contest. 5. Saquon Barkley, NYG vs NO (RB5) — The rookie has been as advertised so far this season. 6. Michael Thomas, NO @ NYG (WR1) — Thomas has seen 40 targets this season and caught 38 of them. Unbelievable. 7. Antonio Brown, PIT vs BAL (WR2) — Okay, so he hasn’t gotten off to an elite start, but Brown is still an elite fantasy option. 8. Odell Beckham Jr., NYG vs NO (WR3) — Beckham is currently fifth among wide receivers in targets and sets up for a big day this week. 9. James Conner, PIT vs BAL (RB6) — He isn’t Le’Veon Bell, but Conner is seeing Bell’s workload. 10. 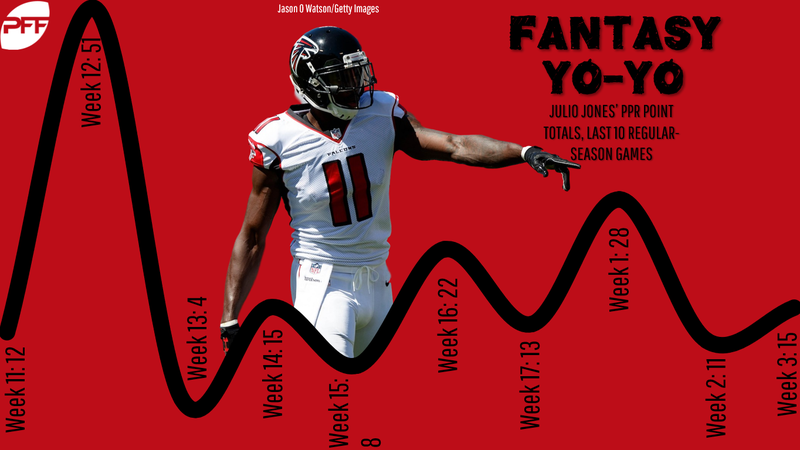 Julio Jones, ATL vs CIN (WR4) — Jones was overshadowed by Calvin Ridley last week, but he’s still a top fantasy option at the position. 11. Tyreek Hill, KC @ DEN (WR5) — Don’t sweat last week’s stat line. Hill bounces back this week. 12. DeAndre Hopkins, HOU @ IND (WR6) — The Colts secondary is better than we thought, but Hopkins still offers solid WR1 value this week based on his heavy volume. 13. Giovani Bernard, CIN @ ATL (RB7) — With Joe Mixon out, expect a ton of Bernard in the favorable matchup against a banged-up Falcons defense. 14. Jordan Howard, CHI vs TB (RB8) — Howard hasn’t been the most efficient back so far, but he’s averaging 21 touches per game. 15. Rob Gronkowski, NE vs MIA (TE1) — You can’t keep a good Gronk down for long.